“The Grudge,” based on the more distinguished Japanese film “Ju-on,” is light on plot but garners a 4 out of 5 on the Scare-O-Meter. Japan has a long, ghostly tradition with beings from beyond the grave. Many of the ghosts that appear in plays and stories are females seeking revenge for wrongs done to them during their lifetimes, typically by cruel, heartless husbands. In the old ghost stories, vengeful Japanese ghosts would continue to haunt their victims until they went insane, died, or at least made some form of restitution to appease the angry spirits. Some Japanese ghosts were born out of tragedy or sorrow and would haunt any person who came near. These spirits were particularly feared because they represented a danger to all unless they were somehow put to rest. Although I knew about the horrific nature of old Japanese ghosts, I had thought modern Japanese ghosts would be more polite and demur. I had imagined a modern Japanese ghost timidly coming up to someone and saying “Sumimasen (Excuse me)! BOO! Gomen nasai (I’m sorry)!” before whisking away. “The Grudge” (2004) showed me how wrong I was about modern Japanese phantoms. 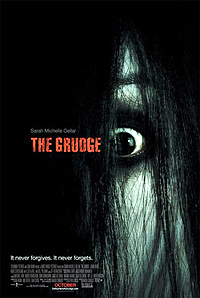 Starring Sarah Michelle Gellar of TV’s “Buffy the Vampire Slayer” fame, “The Grudge” depicts a haunting by very impolite spirits. Gellar plays an American student nurse in Tokyo who accidentally gets involved with a haunted house that has the nasty habit of killing visitors. The ghosts of the house were victims of a tragedy and now they rudely kill anyone who comes in contact with them. For Western audiences it may seem unusual that the two main ghostly antagonists who having been innocent victims of a violent death themselves would seek to cause the death of another innocent person. In many Western stories, ghosts are often motivated by the same things as living people namely the pursuit of justice for wrongdoings. The ghost of a murdered person will seek vengeance on the person or persons responsible for their death. If a ghost is malevolent, it often turns out they were a bad person in life — as in the back-story to the main ghost character in the “Poltergeist” (1982-1986) movies. To understand the nature of the supernatural entity of “The Grudge,” one has to understand Japanese belief in spirits and the supernatural. This type of spirit is called a “goryo” — vengeful ghost. A goryo, however, is less like a consciously aware ghost that plots revenge and would be more familiar to Western audiences. A goryo is more like the energy of the emotion created at the time of death. And to some degree it represents the unconscious mind free of the limitations and morals of the conscious analytic side. Formal belief in goryo can be traced to the Heian Period (794-1185) when goryo were thought to be the angry spirits of political enemies that had died in exile or had been executed. The noted scholar Sugawara-no-Michizane became one suchgoryo. Through guileful manipulations, his enemies at the Imperial Court engineered his banishment from Kyoto. Sugawara died in extreme sorrow while in exile. Shortly after his death, a number of natural disasters occurred from droughts and epidemics to lightening strikes, which were believed to be caused by the angry spirit of Sugawara. To appease his goryo, Sugawara was given a ceremonial promotion at the Imperial Court and eventually he was made into a god-spirit whom modern-day students pray to for success on their exams. Goryo were vengeful spirits from the aristocracy who like Sugiwara have the power to affect the very seasons. Another more commonly experienced type was onryo. While less powerful than thegoryo, the onryo were the ghosts that kept Japanese of then and now frightened out of their wits. Onryo are typically depicted with wild unkempt hair in a white burial kimono. Although onryo could be either male or female, the most popular onryo were women. Often powerless while in life, these female onryo wielded great power in death. They would wreak vengeance on husbands and lovers who spurned or hurt them in life usually by driving them mad with fear. Director Takashi Shimizu has built on this old concept to create a deadly onryo of a very frightening ghostly mother and son duo. “The Grudge” is an American remake of the original Japanese thriller “Ju-on” (2003). “Ju-on” is Shimizu’s horror franchise that grew out of a short TV story to become a successful and scary theater-release movie which was followed by a sequel. Famed “Evil Dead” director Sam Raimi, who helped produce the American remake, thought “Ju-on” to be one of the scariest movies he had ever seen. “The Grudge” opened in America during the Halloween season last fall but it has only recently opened in Japan. One notable difference is the inclusion of a few extra violent moments that were left out in the American version in order for the movie to keep a PG-13 rating in the States. Overall there’s not much of story. Some people die, then some other people die. Most of the film is just one scare after another, with little character development or plot. “The Grudge” is more like a series of creepy vignettes strung together to make a film. However, these vignettes are quite scary. It’s the cultural nuance of the goryo/onryo-type spirit that “The Grudge” represents and the genuinely frightening moments that makes the film an interesting experience for Japanophiles and horror fans alike. On the Scare-O-Meter, “The Grudge” rates about 4 out 5 screams. On plot, it rates about 2 stars out of 5; however the concept behind the movie rates about a 4. This is a film review I originally did for OhMyNews, an online Korean newspaper, back in 2005. I’ve included a video review of the Ju-on series by the late Rodger Swan. Japanese Girl Sings Norah Jones "Don't Know"